Comfort — No goopy mess, unpleasant taste, or gagging. This system uses a compact hand-held wand so there’s no pulling, stretching or poking in your mouth. Efficiency — The scanning process will typically take ten minutes. Calm and Well-being — You stay in control. The iTero scanning process can be stopped and started as many times as you need. Precision — The iTero creates a precise copy of the restoration site and a more accurate fitting dental crown or bridge. The increased accuracy of the digital impressions produces a better fitting crown, which allows us to seat the crown in approximately half the time it took with the previous impression method. Increased comfort, decreased time, that’s a real benefit for our patients. If you’re going to receive the best care available in dentistry, you need to have the latest and best dental technology. Dr. Stewart and Dr. Hull are completely committed to using the best tools available to help you gain and maintain dental health at our Comstock Park office. We use digital x-rays, including panographic digital x-rays. 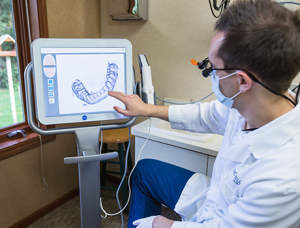 In addition, we use dental laser technology for dental hygiene and periodontal health, take impressions digitally without the mess and discomfort of impression material and trays, and use the Velscope to screen for oral cancer. VELscope is used by dentists and hygienists. It is a small handheld device that allows practitioners to give examinations that can detect a variety of oral health issues and diseases, even cancer and pre-cancer. Many conditions are not visible under ordinary light, but are under the VELscope, which is used as a complementary tool to standard examinations. This is one of the best non-invasive dental technology devices to be clinically proven to detect oral disease, including oral cancer. One of the problems with traditional x-rays is that they use a LOT of radiation. Digital x-rays use up to 90% less, and can still be more effective in detecting cavities. How is this possible? Simply because with digital formats, the images can be quickly viewed on a monitor and highlighted, magnified, and contrasted. These advantages translate into earlier detection of cavities, and less pain for a cosmetic dentistry patient who needs to have an issue corrected. To improve our service to you, we have a patient-friendly diode dental laser available for our patients in the Grand Rapids area. A diode laser is also called a soft tissue laser because it only works on soft tissue and can’t be used to cut tooth structure and bone. It provides patients with comfortable, preventive, minimally invasive treatment options. One option that we are particularly pleased about is laser-assisted bacteria reduction–a procedure designed to control anaerobic bacteria that accumulate between the teeth and under the gum line. This dental laser is an important tool in fighting gum disease. It can actually help regenerate and attach tissue to the teeth. We also can use our dental laser to painlessly remove canker sores and cold sores. Invisalign is the clear way to straighten teeth. Invisalign dental technology gradually moves your teeth through a series of custom-made, removable, nearly invisible aligners. To experience laser dentistry or any of the other comfortable dental technology options we have, contact our Comstock Park office today at 616-784-2377! We look forward to hearing from you if you are in the Grand Rapids area, from Comstock Park to Rockford, MI!